There are lots of guitar player who have special guitars associated with them, but Neil Young's Old Black has a special place in the pantheon of rock. 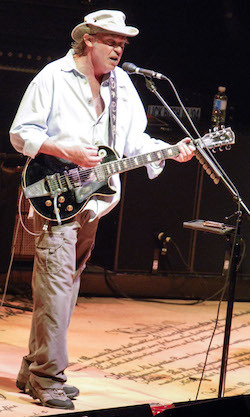 Listen to Neil Young playing electric guitar, whether solo or with Crazy Horse and the chances are he's playing Old Black, the Les Paul Gold Top he first acquired in 1969. There are a couple of different explanations as to how Young first acquired Old Black. Some say he exchanged an Orange Gretsch 6120 Chet Atkins with sometime Buffalo Springfield collaborator, Jim Messina. Others claim the exchange was with Buffalo Springfield bandmate, Stephen Stills, and was for the Gretsch White Falcon that Young had played up to that point. Young still plays a White Falcon occasionally, though whether it's the same one or not, we don't know. 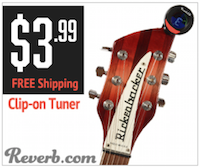 The neck pick-up has always been a P-90, covered by a P-90 pick-up cover, probably from an ES-335. The Tune-o-matic bridge is a replacement piece, not having been around in 1953. The other key component, as far as Old Black is concerned, is the iconic Bigsby tremelo and tailpiece, believed to have been fitted in 1969. Among the other modifications are the aluminium pickguard, Schaller machine heads, and nickel hardware. The headstock is also interesting, as it houses a mother of pearl inlay, known as the 'wheat-stack.' This is typical, according to Wikipedia, of 1950s Les Pauls which had neck replacements in the 60s. A switch on the body, between the volume and tone knobs, allows Young to bypass the potentiometers and capacitors and send the signal directly to the amp. Check out the video below of Young and Crazy Horse playing Like a Hurricane at Farm Aid in 2011 to appreciate just how much the great man wrings from Old Black. One of my favourite things about Old Black is its condition. It looks like a guitar that's travelled thousands of miles and put in thousands of hours playing time. The paint job is fading, there are scratches, the nickel is scratched. It looks, to me, exactly how I would want the guitar played by the writer and performer of 'Rockin' in the Free World' to look. 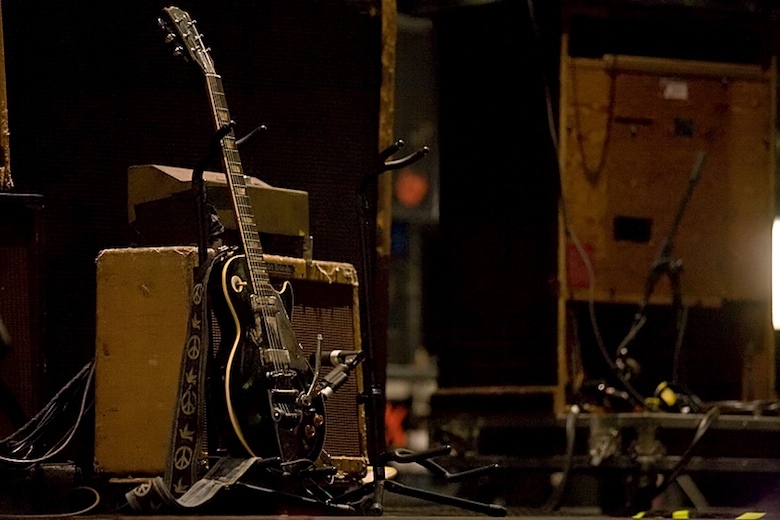 You can read more about Old Black and Neil Young's guitar sound here. Old Black on stage by Frank Yang. Neil Young by Adrian M. Buss.